Occasionally I will post a photo I have taken. This is one of those occasions. I took this a few years ago while visiting a local zoo. Now I have mixed feelings on zoos. I love seeing the animals, I think they could have a better life out of captivity. Anyway, this is not really a debate about the ethics of zoos, although to me this captures everything about this statement. 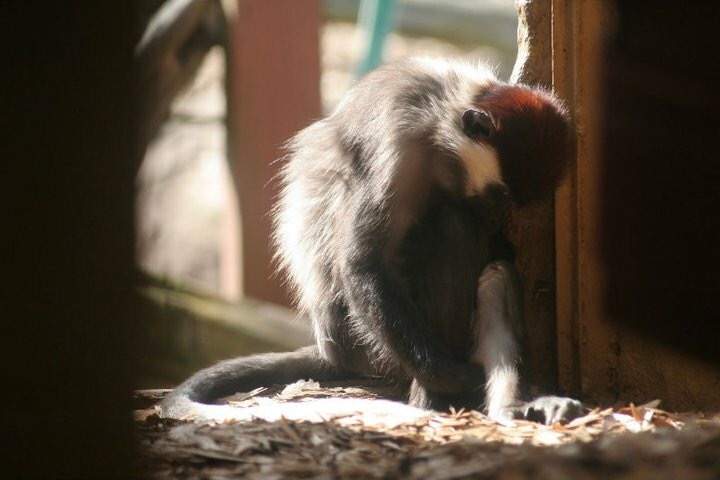 The monkey looks so sad, despite getting the best care the zoo can offer. Not to blow my own trumpet but I love the how the light and shadows play in this shot. The dark edges making the focal point confined to the centre of the frame. If nothing else this makes a change from me writing about Greek mythology. Stuff & Bits For The Muddled and Addled. I speak in colours and metaphors. A Mix-Up of Mysteries, Conspiracie and All Things Spooky! Hopeless romantic speaking her thoughts. This is the page where I will share my thoughts about football, my memories and funny stories. A panorama is defined as an unbroken view of the whole region surrounding an observer. My panorama includes a jumbled mess of ideas and thoughts waiting to be typed out. Welcome to my panorama.
" Work without Hope draws nectar in a sieve, And Hope without an object cannot live. "